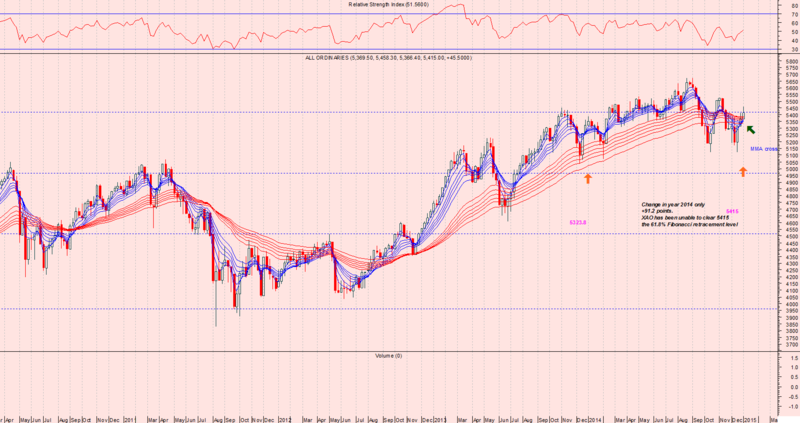 Home › Technical Analysis › Chart Analyses › Index Charts can be misleading. Index Charts can be misleading. Investors today are fortunate to have access to vast amounts of incredibly detailed market and fundamental data to aid them in making investment decisions. The computerised aggregation of stock specific information into security cohorts according to market sectors is a further service which helps analysts find sectors that may be under or over performing the full market. Individual stock specificity is sacrificed to be able to generalise about the market as a whole or its segments. “Bottom-up” analysts search the whole market for stocks that fit their investment criteria. “Top-down” analysts narrow their search by focusing on stocks in the best performing market sectors. This has focused attention on Australia’s vulnerability to commodity prices, and lack of manufacturing competitiveness. However indices do not necessarily accurately mirror investment sentiment and returns. A bullish market in 2013 set the scene for multiple capital raisings, and IPOs in 2014 (there were 60 IPOs raising a total of US$14.6 million). The biggest float was Medibank, valued at $5.68 billion. It is probable that with so much money entering the market in 2014, capital raisings will be harder to find in 2015, but the already raised capital should help increase corporate earnings in 2015 one would think. Many investors will have still enjoyed outstanding returns in 2014, particularly if they were able to exploit the many trading opportunities associated with the new issues. Australians also enjoy a more generous dividend flow, boosted with imputation credits, than other countries.